CD Genomics is offering five platforms for genome-wide epigenomics analysis, each designed to accommodate a wide range of sample types and suit your specific research needs, allowing researchers to look at epigenetic alterations easily. This information will help us not only understand the role of DNA methylation but also identify targets for therapeutic treatment. Epigenetic modifications are reversible modifications that affect gene expression without altering the DNA sequence and can be inherited during cell division. Two of the most characterized epigenetic modifications are DNA methylation and chromatin modification. Epigenetic modifications play important roles in gene expression and regulation, and are involved in numerous cellular processes such as in differentiation, development and tumorigenesis. DNA methylation is most frequently observed at the C5 position of cytosine followed by guanine (CpG site) in vertebrates, or non-CpG sites such as CHG and CHH in plants or mammalian embryonic stem cells. DNA methylation is established and maintained by DNA methyltransferases (DNMT1, DNMT3a, and DNMT3b). DNA methylation information may be lost during standard molecular biology manipulations, such as molecular cloning in bacteria and PCR, due to lack of maintenance of DNA methyltransferases. Several techniques include methylated DNA immunoprecipitation (MeDIP), bisulfite sequencing (BS-seq), and reduced representation bisulfite sequencing (RRBS) have been proposed to preserve DNA methylation information and simultaneously transform it into quantitative and measurable signals. By combining with high-throughput sequencing, these techniques have provided comprehensive and reliable genome-wide information regarding DNA methylation. 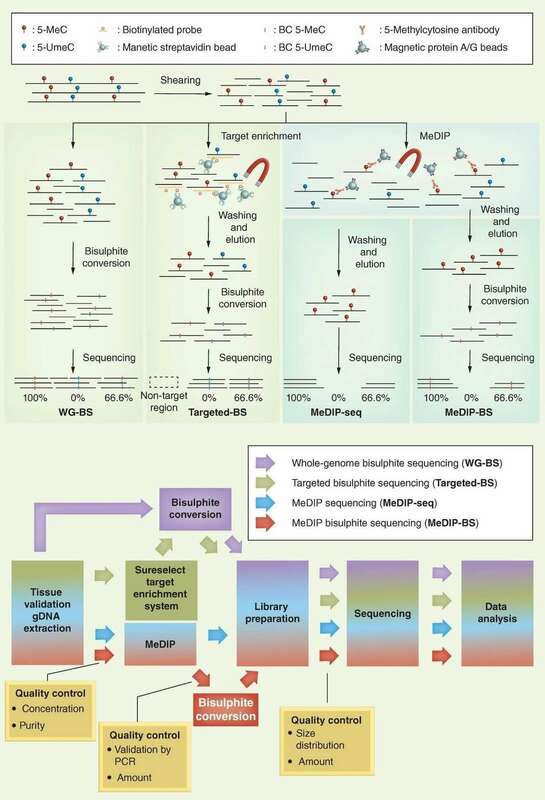 A brief outline and workflow of different NGS-based DNA methylation sequencing technologies is shown in below Figure 1. Figure 1. Different NGS-based DNA methylation analysis methods (Jeong et al., 2016). In terms of the merit and bias of these methods, BS-seq and RRBS can generate a base-resolution DNA methylome, whereas MeDIP-seq can only generate relative enrichment of specific regions across the genome. Chromatin immunoprecipitation (ChIP) offers an advantageous tool for studying the levels of histone methylation associated with a specific gene promoter region between normal and diseased tissues. Identifying the genetic targets of DNA binding proteins and revealing the mechanism of protein-DNA interaction is crucial for understanding cellular processes. Chromatin immunoprecipitation sequencing (ChIP-seq) allows you to make the most of your chromatin studies with minimal sequencing bias. Our long-standing experience and advanced platforms allow us to offer comprehensive service package from project consultation, Immunoprecipitation, library construction, sequencing and bioinformatics analysis. Reference Jeong H.M., et al. Efficiency of methylated DNA immunoprecipitation bisulphite sequencing for whole-genome DNA methylation analysis. Epigenomics. 2016, 8(8):1061-77.